Be sure to come by and get one of our brand new, limited edition Raiders parody t-shirt while supplies last. Look as good as Beauty when you wear it. * * Actual results may vary. We proudly present our 2015 calendar chock full of our featured dancers and waitresses. Visit us and pick one up for only $20 while supplies last. You can also have one of the calendar girls autograph your calendar while at Sam’s. 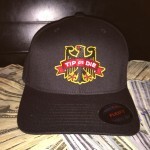 We just got our new “Tip or Die” baseball caps available for purchase while supplies last. 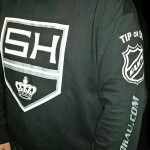 As a celebration of the Kings winning the Stanley Cup, we have a new Kings Victory black shirt. As always, this is a limited edition and when we run out, we will not have any more of these shirts. 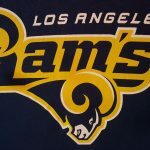 Close up of front SH logo shown below. Back of Victory shirt below. Here’s a brand new limited edition shirt just for you gals out there. This one is a Sailor Jerry Mermaid Parody t-shirt. Come to Sam’s to get it before we run out. 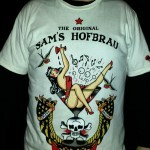 It’s time again for our limited edition “Sailor Jerry Martini Girl” parody white t-shirt. 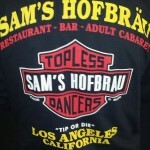 Available only at Sam’s Hofbrau while supplies last. 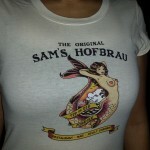 Front – Shows the iconic Sailor Jerry martini girl. This amazing shirt even makes Pablo look skinnier. 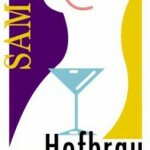 Back – Sailor Jerry style Sam’s Logo with beer mug. 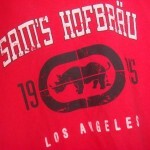 Once again, we have a limited edition Sam’s Hofbrau Bike Club t-shirt available. 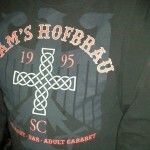 This is the front of this long sleeve black shirt, with our unique style logo, with the “Tip or Die” logo on the sleeve. 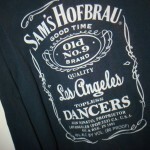 The back of the shirt is shown above. 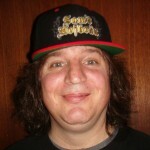 Pablo is wearing one of two of the new 2012 Baseball Caps with gold lettering. 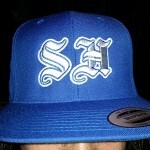 You can also get the same cap with red lettering. Get it while supplies last. Click on the picture to see a big version of Pablo’s face. Sam’s Eye Candy 2013 Calendar Our first 16 months calendar full of pictures of our dancers and waitresses. Pick one up for $20 $10 FREE before we run out. These are limited edition prints 60 s/n 15 a/p $200.00 each. That’s right. Real art from Sam’s.